Nelson Rolihlahla Mandela was a South African anti-apartheid revolutionary who was imprisoned and then became a politician and philanthropist who served as President of South Africafrom 1994 to 1999. He was the first black South African to hold the office, and the first elected in a fully representative election. His government focused on dismantling the legacy of apartheid through tackling institutionalised racism, poverty and inequality, and fostering racial reconciliation. Politically an African nationalist and democratic socialist, he served as the President of the African National Congress (ANC) from 1991 to 1997. 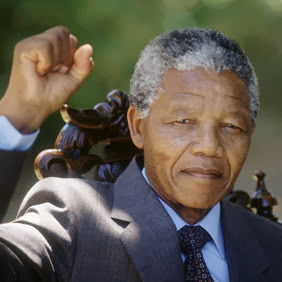 Internationally, Mandela was the Secretary General of the Non-Aligned Movement from 1998 to 1999. Mandela served 27 years in prison, initially on Robben Island, and later in Pollsmoor Prison and Victor Verster Prison. An international campaign lobbied for his release, which was granted in 1990 amid escalating civil strife. Mandela published his autobiography and opened negotiations with President F.W. de Klerk to abolish apartheid and establish multiracial elections in 1994, in which he led the ANC to victory. As South Africa's first black president Mandela formed a Government of National Unity in an attempt to defuse racial tension. He also promulgated a new constitution and created the Truth and Reconciliation Commission to investigate past human rightsabuses. Continuing the former government's liberal economic policy, his administration introduced measures to encourage land reform, combat poverty, and expand healthcare services. Internationally, he acted as mediator between Libya and the United Kingdom in thePan Am Flight 103 bombing trial, and oversaw military intervention in Lesotho. He declined to run for a second term, and was succeeded by his deputy, Thabo Mbeki. Mandela subsequently became an elder statesman, focusing on charitable work in combating poverty and HIV/AIDS through the Nelson Mandela Foundation. Although Mandela was a controversial figure for much of his life, he became widely popular during the last two decades following his release. Despite a minority of critics who continued to denounce him as a communist and/or terrorist, he gained international acclaim for his activism, having received more than 250 honours, including the 1993 Nobel Peace Prize, the US Presidential Medal of Freedom, the Soviet Order of Lenin and the Bharat Ratna. He is held in deep respect within South Africa, where he is often referred to by his Xhosa clan name, Madiba, or as Tata ("Father"); he is often described as "the father of the nation". Mandela died following a long illness on 5 December 2013, aged 95, at his home in Johannesburg. Visit The Nelson Mandela Foundation page to leave a message of condolence for his family.